What is HCCI – HunterLab Coffee Color Index? 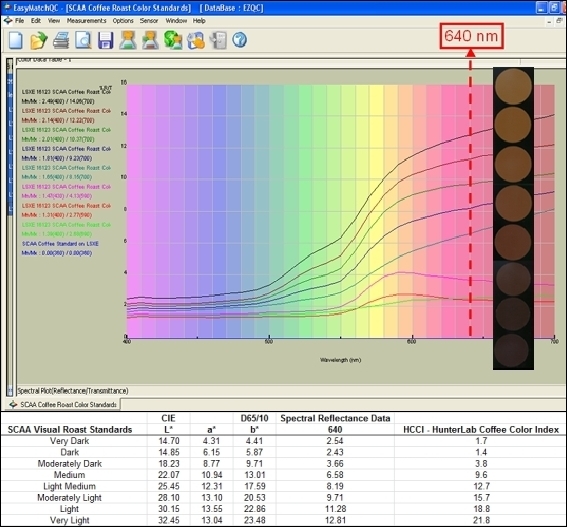 HCCI – HunterLab Coffee Color Index measures the reflectance of ground coffee products at 640 nm, which is optimal for defining the degree of roast. HCCI works best for measuring during the roasting process, taking the coffee product to a consistent end point. HCCI* comes with a user-adjustable bias and offset in each setup to allow display in agreement with existing instruments. HCCI values are typically displayed to 1 decimal place. HCCI correlates well with the visual SCAA Roast Standards and exhibit 20 unit range. The HunterLab ColorFlex EZ Coffee meter comes with a built-in correlation to report HCCI – HunterLab Coffee Color Index, SCAA # and SCAA Roast Classification, all used to quantify the degree of coffee roast. HunterLab ColorFlex Coffee with HCCI# with correlated SCAA# and SCAA Roast Classification displayed. In theory, yes; in practice, maybe. HCCI, implemented in the CFEZ Coffee Meter, does have a user-configurable offset and gain that your customer can tailor the output value to their process color. Be cautioned, however, that this metric was optimized based on the reflectance at 640 nm. This is the spectral point of greatest change for the intended application of quantifying coffee roast color. Your customer’s dark-to-light brown process should be similar but they should look at the reflectance curves for a range of their product color to verify 640 nm represents a significant change point with their process. As alternate metrics, L* lightness value, b*/a* ratio or % Strength may also work to color quantify their process while being more robust as a metric and in more general use for all colors.